Screen adaptations of well-known books are a tricky art. Stray too far from the source material, and purists will be upset. Stick too close to the text, and you risk alienating others. “Native Son” sits somewhere in-between paint-by-number loyalty and artistic interpretation. 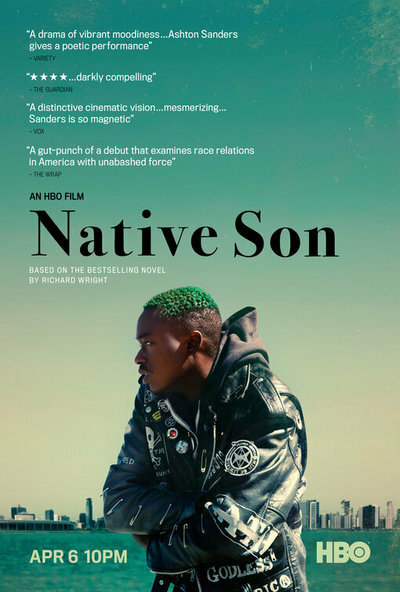 Director Rashid Johnson and screenwriter Suzan-Lori Parks have added to and excised out enough of Richard Wright’s controversial 1940 novel to make their version of “Native Son” distinctly theirs. Yet, does this version of a tragic story, whose source material has not aged gracefully, have something new to tell audiences in the era of Black Lives Matter and #MeToo? Cinematographer Matthew Libatique casts “Native Son” under a gloomy shadow in every frame. The clouds never seem to part, the lightbulbs always seem dim. It’s as if hopelessness follows Bigger through his every waking minute. The only things that break this monotonous gloom are occasional pops of brighter colors. Bigger’s green hair is an excellent standout feature, setting him apart from everyone else in the movie. There are also the vivid blue walls of Bigger’s bedroom at home and graffiti-lined spaces that inject a sense of life into the painful story. As if the overcast cinematography wasn’t ominous enough, the movie’s fatalist tone is driven home by a foreboding score by Kyle Dixon and Michael Stein. A new job opportunity comes Bigger’s way and he’s thrust into an uncomfortable sphere of privilege. His new employer, a real estate tycoon named Mr. Dalton (Bill Camp), wants to help him out while displacing families like his. The paradox is not lost on Bigger, but he takes the job of driving the Dalton family because he needs the money. Most of his time on the job, at least what’s shown onscreen, involves watching over Mr. Dalton’s spoiled college-aged daughter, Mary (Margaret Qualley), who sneaks off with her politically-minded boyfriend and cajoles Bigger to let her stay out late into the night. Hoping to earn her trust, and not lose his job, he reluctantly goes along with it, until one drug-fueled night where everything goes horribly wrong. There’s something about how the camera lingers over the crime scene that didn’t sit well with me or with other members of the Sundance audience when I first watched the movie. The fears and anxiety shouldered by Bigger manifest into accidental manslaughter. That scene and one that follows involving an old furnace in the mansion basement feel exploitive and cruel. Bigger’s uncontrollable violence later reaches Bessie but stops short of what happens to her in the book. “Native Son” has always had this uncomfortable gender divide, which feels even more pronounced as women have fought back against violence. While Johnson and Parks explore the troubled psyche of a black man afraid for his life, how it gets to that point remains complicated. “Native Son” posits Bigger is a victim of circumstance, someone reduced to cruelty and violence because of racism and systemic oppression. James Baldwin tangled with its legacy in Notes of a Native Son, calling Wright’s portrayal of Bigger stereotypical and his tragic story as one intended for white audiences. With this remake, it’s another generation’s chance to wrestle with Wright’s ideas. The movie is at once struggling with what it wants to say, what it needs to say and what history has said before it, and its message becomes muddled in the process.